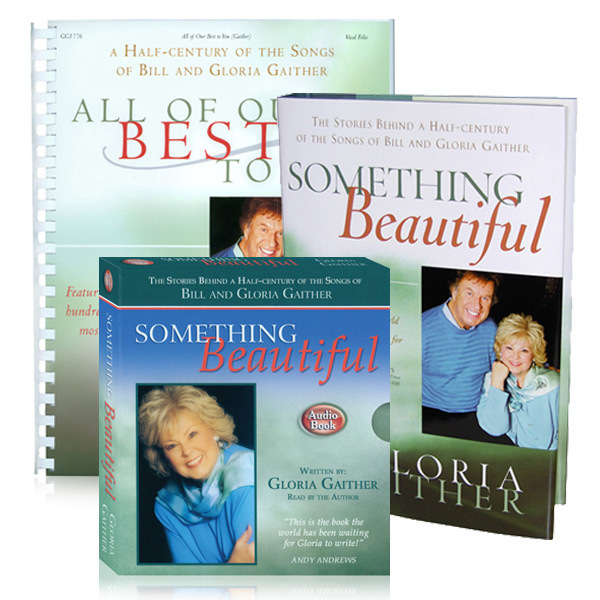 Something Beautiful, written by Gloria Gaither, is a once-in-a-lifetime collection of stories behind the songs sung around the world. Gloria has opened her heart once again through words that will bring joy, hope and healing to the reader. Encompassing 7 CDs, the audio book of Something Beautiful will captivate you from the very beginning. The warmth and engaging quality of Gloria's own voice takes you to the heart of these eighty cherished stories behind the songs of Bill and Gloria Gaither. This spoken project is the final piece in the masterful compilation. This audio book will make a wonderful devotional for car and home, and will serve as a great introduction to the songs when used by choirs, worships teams, vocal groups or congregations. All Of Our Best To You Songbook, from PraiseGathering Music, is a comprehensive collection spanning a half-century of the songs of ASCAP's 2000 "Songwriters of the Century" award winners, Bill and Gloria Gaither. More than 100 of the timeless lyrics and melodies that have captured the hearts of believers, this folio compilation is certain to become a treasured classic. 32. Have You Had A Gethsemane?